Over the weekend, our weather turned bitter cold. I know lots of places have already had snow but this weekend was our first really long stretch of super cold weather. It was brutal to spend any time outdoors so, after I was done prepping for our annual Christmas party, I made some delicious roasted red pepper soup to warm everyone in the house up just a bit. This soup is super easy to make which makes it perfect for a busy, hectic day during the holiday season. 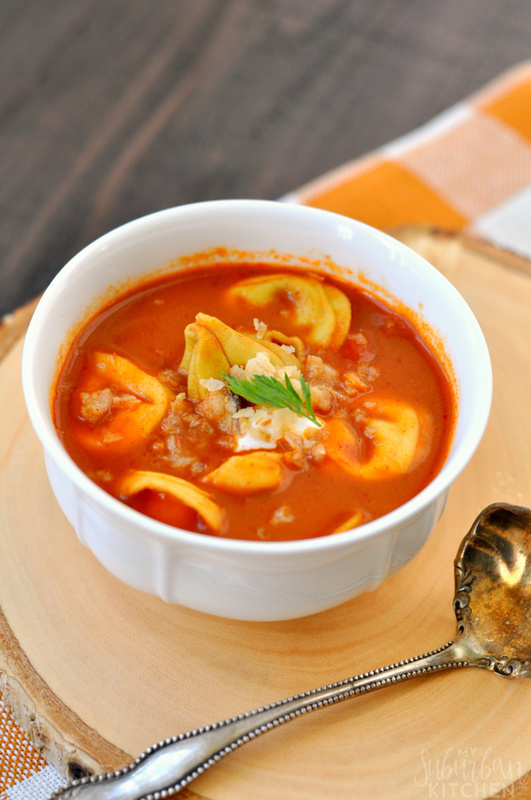 The cheese tortellini makes it hearty enough for a full meal too. Just grab some crusty bread to go along with because you will want to sop up every bit of the soup in your bowl. 1. Heat olive oil over medium heat in a large pot. Add onion and cook for 2-3 minutes or until beginning to soften. Season with salt and pepper. Add garlic and cook for an additional 1 minute. 2. Stir in tomato paste, paprika and Italian seasoning. Cook for 1 minute or until fragrant. 3. Stir in broth, tomatoes and red peppers. Cook for 10 minutes or until heated through. Remove from heat and, using an immersion blender, carefully puree the soup until smooth. 4. Return pot to stove over medium-low heat and add tortellini and cook for an additional 7-10 minutes or until pasta is cooked. Season with salt and pepper. Serve topped with grated Parmesan and Greek yogurt if desired. If you prefer to roast your own red peppers, it is really easy to do and they taste amazing in the soup. I wrote the recipe using jarred peppers to keep it fast and simple. Here is a great tutorial on how to roast red peppers at home if you prefer to try that way. For this soup, you would want 7 or 8 medium sized peppers. I use fresh tortellini like Buitoni or similar. 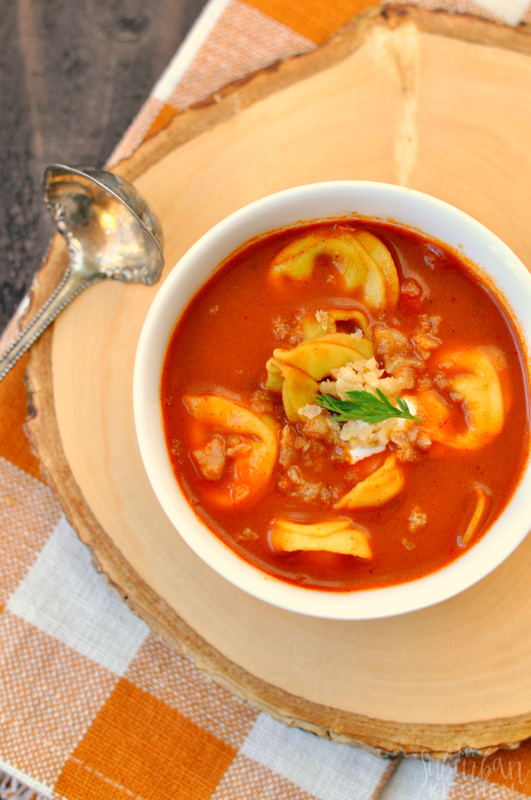 If you choose a frozen tortellini, just thaw it before adding to the soup or increase the overall cooking time after the pasta is added. Heat olive oil over medium heat in a large pot. Add onion and cook for 2-3 minutes or until beginning to soften. Season with salt and pepper. Add garlic and cook for an additional 1 minute. Stir in tomato paste, paprika and Italian seasoning. Cook for 1 minute or until fragrant. Stir in broth, tomatoes and red peppers. Cook for 10 minutes or until heated through. Remove from heat and, using an immersion blender, carefully puree the soup until smooth. Return pot to stove over medium-low heat and add tortellini and cook for an additional 7-10 minutes or until pasta is cooked. Season with salt and pepper. Serve topped with grated Parmesan and Greek yogurt if desired. Yum! This looks wonderful! We’re just getting started with our cold weather too (Texas) and I love cooking soups, stews, and chili during the cold months so I’m always looking for new recipes. Thanks for sharing at Over the Moon. We look forward to seeing what you have to share with us in the new year. Have a wonderful holiday and Merry Christmas! Absolutely my kind of soup..I can have this anytime. 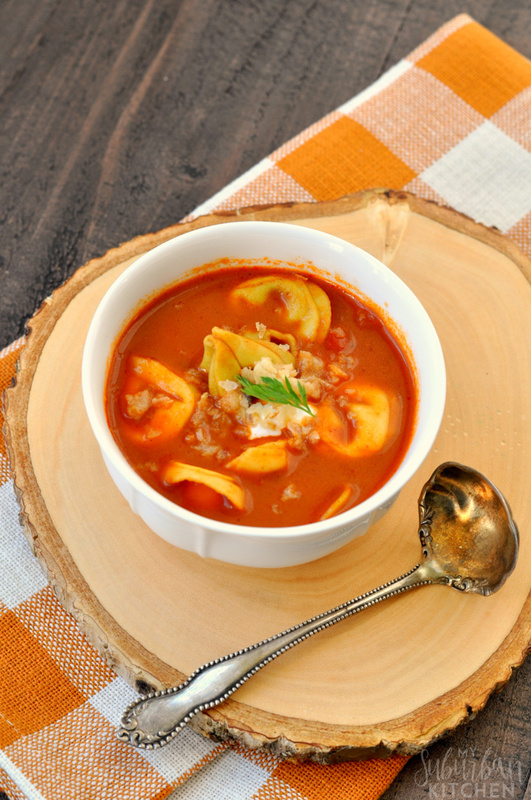 The soup looks so tempting in your pictures, I am bookmarking it ! I love a good soup and this one looks amazing to me. Thanks for sharing! This sounds so good right now! Pinning! Thanks for linking up to Funtastic Friday! What a great and delicious soup, this looks delicious! Thanks so much for sharing your awesome recipe with us at Full Plate Thursday! Hope you are having a wonderful week and hope to see you soon! I love a good bowl of soup in the wintertime. Thanks for the delicious recipe idea, and thanks for linking up with us at Share the Wealth Sunday! Looks Yummy. Thanks for sharing at the Inspiration Spotlight party. Shared. Happy Holidays! I love the addition of tortellini in here and how it can be vegetarian.